Wee (left), and Prudential Corporation Asia chief executive Nic Nicandrou signed an agreement on Thusday to renew their strategic regional bancassurance arrangement. Under the arrangement, the UOB Group will distribute the Prudential Group’s life insurance products to its consumer banking customer base in Singapore, Indonesia, Malaysia, Thailand and Vietnam. KUCHING: United Overseas Bank Limited (UOB) has signed an agreement to renew its strategic regional bancassurance arrangement with the Prudential Group for 15 years. A fee of S$1.15 billion will be paid that will be accrued over the life of the bancassurance arrangement. Under the arrangement, the UOB Group will distribute the Prudential Group’s life insurance products to its consumer banking customer base in Singapore, Indonesia, Malaysia, Thailand and Vietnam. UOB deputy chairman and group chief executive officer Wee Ee Cheong said the renewed agreement reflects the long-term approach and success of this partnership since 2010, “UOB is focused on creating financial solutions in the best interests of customers and which are essential to their lifestyles and life stages. “We believe that our continued partnership with Prudential will create greater value for our customers and our stakeholders across the region and reinforces our position as the premier ASEAN bank. Eddie Khoo, UOB managing director and head of group retail said UOB has extensive presence and deep local experience across the region. “With these, we know what most suits the needs and preferences of our growing consumer banking customer base. Mike Wells, Group chief executive of Prudential, said, “We have built a highly effective bancassurance partnership with our colleagues at UOB that has driven double-digit annual sales and new business profit growth since 2010. 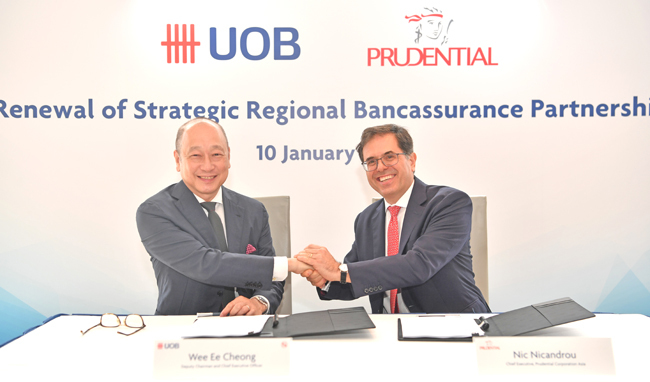 “The extended partnership provides UOB’s growing customer base with continued access to Prudential’s market-leading and innovative product suite, and demonstrates our commitment to fulfilling the evolving savings and protection needs of consumers.